I enjoy Wordles, especially their sheer randomness. I enjoy the way the words - sometimes very different words - slide into each other, juxtaposing or complementing, throwing up poetic combinations here, deep ones there, something funny elsewhere. They're fun to create, as well as fun and beautiful to look at. They're also useful tools for checking up on what I've been writing. In a Wordle, greater prominence is given to words that appear more frequently in the source text, so - literally at a glance - I can see what my main themes and preoccupations have been. 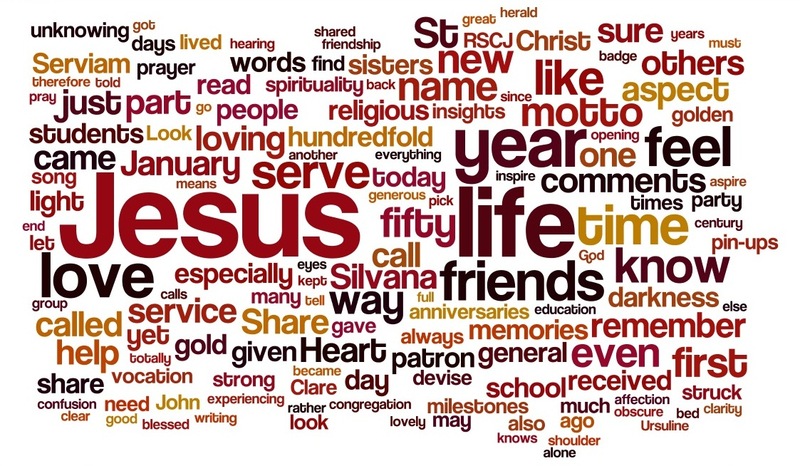 This year, I'm going to try and do a Wordle at the end of each month. Here's the January one - as you can see, very prominently, "January means Jesus"! There's also "look loving hundredfold", "share gold given Heart" and "life time friends know darkness" with God nestled within. Which, for a month highlighted by my fiftieth birthday and a splendid party, friendship, memories and celebration, seems a very accurate summing up. Oh, I love Wordles too! I was first introduced to them by a Benedictine nun who used them for Lectio Divina. I like the idea of a monthly one. 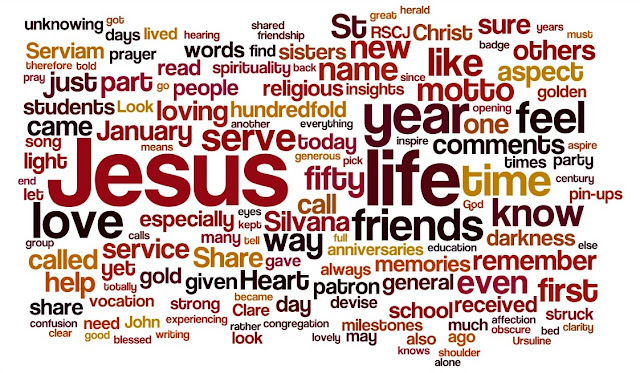 In your January one, I particularly noticed "Jesus love especially Silvana"! Thanks Antonia - for some reason I hadn't spotted that combination, so lovely to know it's there! I'm a fan of Wordles too. It's a good way to remember the message, and how vibrant the message is in your posts. Jesus, Life and Love are wonderful signs on yours!